The mid century modern inspired design of this Chair will evoke a retro charm in your home. Resting atop tapering metal post legs for stylish support, this dining chair is built to last. The chair is upholstered in gray fabric with a foam padded seat and has delightfully bowed back with a smooth arched open design for comfort. Place this chair in your dining room, living room, or any other shared space to add a fun and retro flair to them. Note: Other featured items in the image except this chair are sold separately. 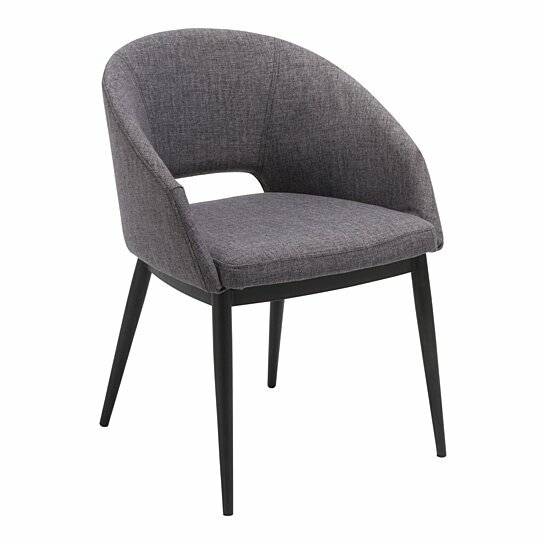 The chair has delightfully bowed back with a smooth arched open design for comfort. Supported by solid metal legs, this side chair is upholstered in durable fabric. This side chair will lend a mid-century touch to your dining room or den ensemble.